The 37-year-old starred in the popular legal drama Suits from 2011 until 2017, when she left to join the royal family. Her poplar character started off as a paralegal and worked her way up to an attorney, culminating in a marriage to her on-screen boyfriend Mike Ross, aka Patrick J Adams. For years she graced our screens in the hit drama, and it seems fans haven’t forgotten her roots. Meghan and Prince Harry have been on a royal tour of Australia, Fiji, Tonga and New Zealand, where they were met by thousands of members of the public. While on a walkabout in Auckland on October 30, pregnant Meghan was met by a crowd of adoring fans – who promptly started singing the Suits theme tune in unison. But not just a rag tag singalong, as an entire band serenaded the Duchess. They belted out Ima Robot by Greenback Boogie as Meghan shakes hands with fans. 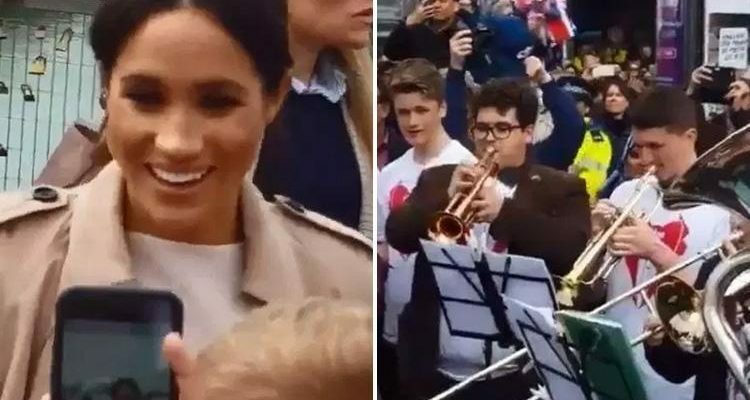 Meghan remains unfazed as she works the crowd, with a powerful trumpet heard above the screaming throngs. Prince Harry, who follows just behind his new wife, happily shakes hands with fans, also seemingly oblivious to the tune. As we get ready for another royal baby Prince Harry has given his baby with Meghan Markle this very cute nickname. And Meghan Markle has been criticised for this ‘unprofessional’ habit – do you agree? The pair crammed in an incredible 76 engagements during their trip – here are the highlights.